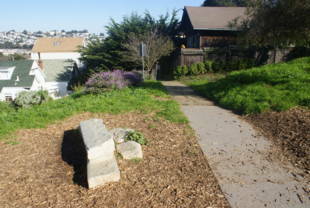 There are two access points: a stairway up the hill on Peralta, and a stairway near Mullen and Franconia. 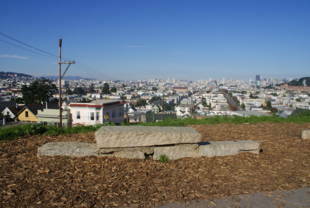 Mullin/Peralta Mini Park is owned by the San Francisco Recreation and Park Department. 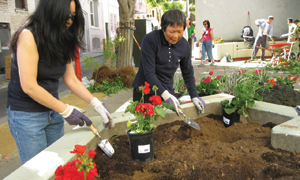 27-Bryant -- Cesar Chavez and Florida Streets. 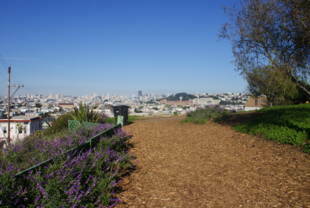 Walk south on Florida, past Precita Ave., to Peralta Ave. Head to the right and follow Peralta to Mullen Ave.
67-Bernal Heights -- Folsom St. and Bessie St. stop (at Precita Park). 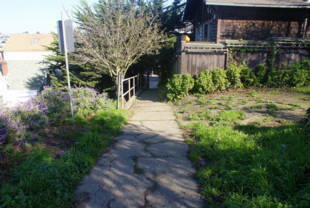 Walk east on Precita, past Treat and Harrison to Alabama St. Go right (south) on Alabama, then left (east) on Mullen to Peralta Ave.